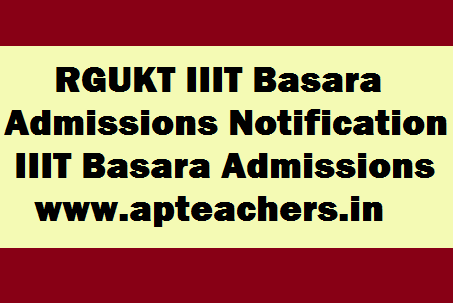 RGUKT IIIT Basara Admissions Notification 2018-19. IIIT Basara Admissions Notification 2018-19. Rajiv Gandhi University of Knowledge Technologies - Basar Undergraduate Admissions - 2018-19 Notification released for 10th Class Students. Applications are invited for admission to the first year of 6-Year Integrated B.Tech program at RGUKT Basar (Telangana State) for the academic year 2018-19. IIIT Basara has released the Admission Notification for 2018-19 Academic Year. The Details in brief are as follows: Rajiv Gandhi University of Knowledge Technologies (RGUKT - Telangana State) (Established by RGUKT Act 18 of 2008 (Telangana Adaptation) Order, 2014) Basar, Nirmal District, Telangana State – 504107 6-YEAR INTEGRATED B.Tech PROGRAM NOTIFICATION FOR ADMISSIONS– 2018 No. 3/RGUKT (TS) / B Tech /Admissions/2018 Dt: 26-04-2018 Applications are invited for admission to the first year of 6-Year Integrated B.Tech program at RGUKT Basar (Telangana State) for the academic year 2018-19.
a) Regular students who passed SSC or its equivalent examination (10th class) held in 2018, in the first attempt. b) Age not more than 18 years as on 31.12.2018 (21 years in case of SC/ST candidates). f) Immediately after submitting the application through online, the applicant should send its print-out duly signed along with copy of the receipt mentioned in 2(c) above and the relevant certificates to The Director, Rajiv Gandhi University of Knowledge Technologies, Basar, Nirmal District, Telangana State-504107, by Speed Post / Registered Post. The candidates should write on top of the cover ‘Application for Admissions 2018 – RGUKT - Basar’. c) Study Certificates from Fourth class to Tenth class/ Residence certificate by those claiming Local category (in any of Osmania University areas (Telangana State), (for details, see Annexure - III). d) Residence certificate / service certificate of parents by those claiming un reserved category of seats (for details, see Annexure - IV). f) Proof of caste / community certificate (SC/ST/BC) in the prescribed proforma by those claiming reservation under any of these categories (for details see Annexure - V). g) Physically Handicapped (PH) certificate in the prescribed proforma by those claiming reservation under this category (for details see Annexure - VI). h) Children of Armed Forces (CAP) certificate in the prescribed proforma by those claiming reservation under this category (for details see Annexure - VII). i) NCC certificate by those claiming reservation under this category (for details see Annexure - VIII). j) Sports certificate(s) at the level of inter-district and above by those claiming reservation under this category (for details see Annexure - VIII). a) Admissions to the first year of Integrated B Tech Program (2018-18) will be based on merit in the Grade Point Average (GPA) and Grade obtained in each subject, and by following the statutory reservations of the State. A deprivation score of 0.4 prescribed by the Government for the year 2018-18 under Statute 13 (3) shall be added to the 10th class GPA of those applicants who studied in non-residential Government Schools including the Zilla Parishad and Municipal Schools, with an objective of providing weight age to the socio economically challenged students in the admission process. a) Candidates should have passed SSC (10th class) or any other equivalent examination recognized by the Governments of Telangana State & AP State and conducted in 2018 in first attempt. my name is sharath,i got 9.7 gpa in my ssc 2017 can i have any chance to join in iit at basar and iam from a telangana model school it is govt. school.Ihave any chance to get a seat in iiit? Did you applied through TS online? Sir,my name is sainemitej.i received 10 gpa in ssc 2018.and I have reservation in sports .i am from private school .can I get seat in Basara IIIT.please leave a reply sir. My daughter got 9 gpa caste sc.I not submitted registered post till now can I submit direct or email now please suggest me.